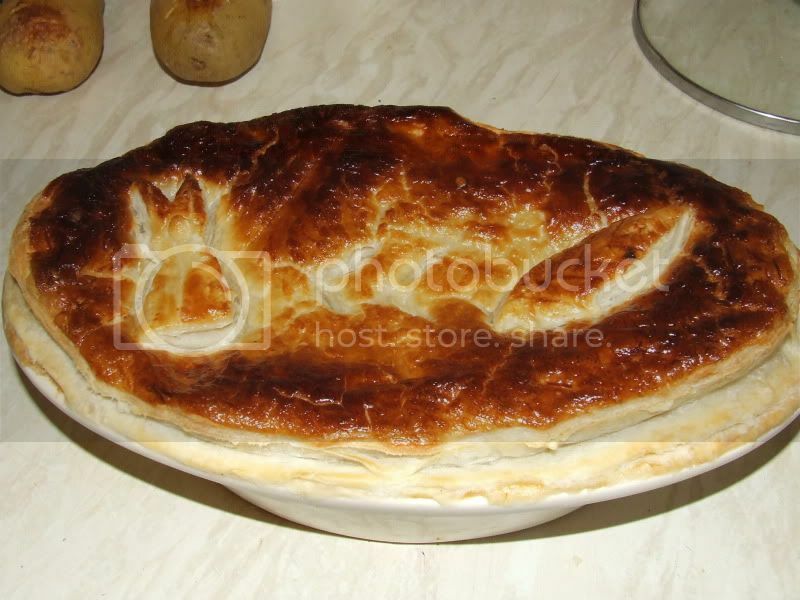 A pie filled with rabbit, ham, chestnut mushrooms and leeks with a cheese and mustard sauce topped with flaky pastry. A basic white sauce, 1 tablespoon of butter or soft margarine, 1 heaped tablespoon of plain flour, salt and pepper, 750mils of milk, 50g of grated cheddar, 1/4 of a teaspoon of Coleman’s mustard powder, 1 small par boiled chopped leek and a handful of chopped flat leaf parsley. Half fat to flour i.e. 150g of flour needs 75g of fat, the fat can be either a mixture of lard and butter or all butter, half a tea spoon of salt. Boil the hock and the rabbit together in the same pan till the meat is falling off the bones of the rabbit. No need to add salt as the hock will salt the rabbit enough. Then strip the rabbit of meat and take all the fat off the hock and chop it into pieces. set the meat to one side in a bowl. For the sauce heat one tablespoon of butter or soft marg in a pan and add salt pepper and the mustard powder, once that has melted add one heaped tablespoon of plain flour to make a rue. Put the pan over a low heat and add the milk a little at a time to make your basic white sauce, once the sauce has thickened and all the milk has been added, you can then add the parsley, leeks and finally the cheese, gently stir till the cheese has melted, then pour over the rabbit and ham and gently fold to mix. For the pastry you can use a packet mix that you just add water too or for flaky pastry a frozen packet mix. If you use a packet mix add half a teaspoon full of salt per 150g of pastry. Or you can make your own. To make you own pastry is simple you use a half fat to flour ratio. Cut the fat into small chunks it is better if you cut them before hand and stick them in the fridge for half an hour to set again. Mix the fat and flour till it resembles breadcrumbs then add water a tablespoon full at a time and stir with a flat bladed knife till the flour collects into a big ball. Wrap the pastry in cling film and put in the fridge for half an hour to rest. If you want to use flaky pastry, you better off buying frozen and using that, as making flaky pastry is pretty time consuming. But if you do want to make it, here is a link on how to. Line your pie dish with the short crust pastry then add a layer of the meat and sauce mixture cover the mixture with a layer of raw sliced mushrooms and fill the dish with the rest of the meat and sauce mixture. Cover the filling with your crust and brush with a beaten egg. Put it in the middle of an oven @220C or gas mark 6 for approx 25 minutes or until the crust is brown. A little tip don’t forget about it like I did. What do they say? The proof of the pie is in the eating. I must say it was lovely even better cold. Now that looks fabulous, thanks for the recipe I shall use that as soon as I can. That sounds delicious. Thank you. I second that. Also your deep fried rabbit. My mum used to make rabbit casserole 40 years ago, with the rabbit rolled in oatmeal first. I think rabbit is a very underrated dish and I just love it, especially Fiona's version. mouth is watering... im of to the sheds to see who's the fattest te he. so not sure what to do! the topic was first posted. Oh well! Worth a try anyway.